Today's a company holiday (odd, but ok), so I figured what better way to start the New Year than to see if my Commodore 64 still works? I bought it in mid-1986, so it's almost 25 years old, and it's been over seven years since I posted My C-64 Rides Again. Since then the monitor I used with my C-64 died, but my dad shipped me his old RBG monitor. Would everything work? Could I access the Internet with it? The answer: YES. 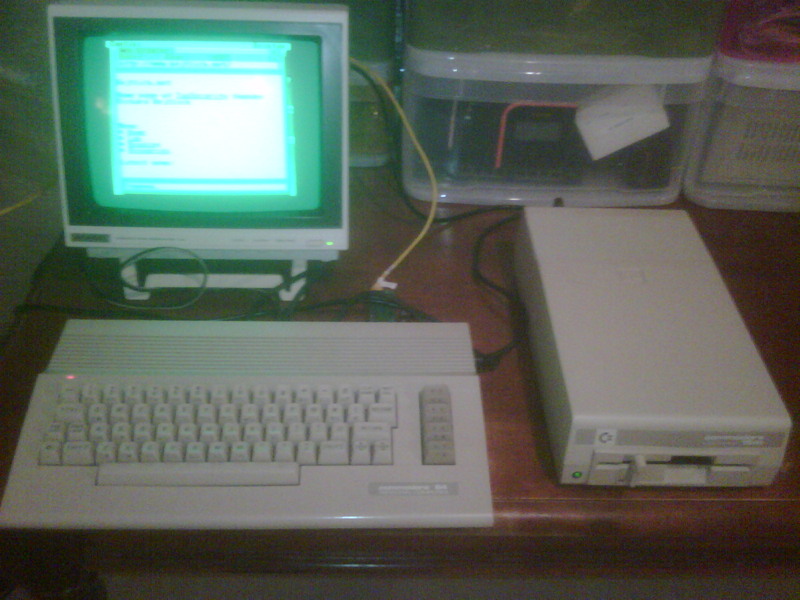 As you can see above, I have a C-64c, with a 1541c disk drive. I even have a 1351 mouse, but I decided not to use it. I found the Contiki OS 5 1/4 floppy that shipped with the NIC I bought for the C-64 in 2003. I was able to LOAD "*",8,1 and get Contiki OS running. At right you can see a visit to the Bejtlich.net Web site using the Contiki OS Web browser. 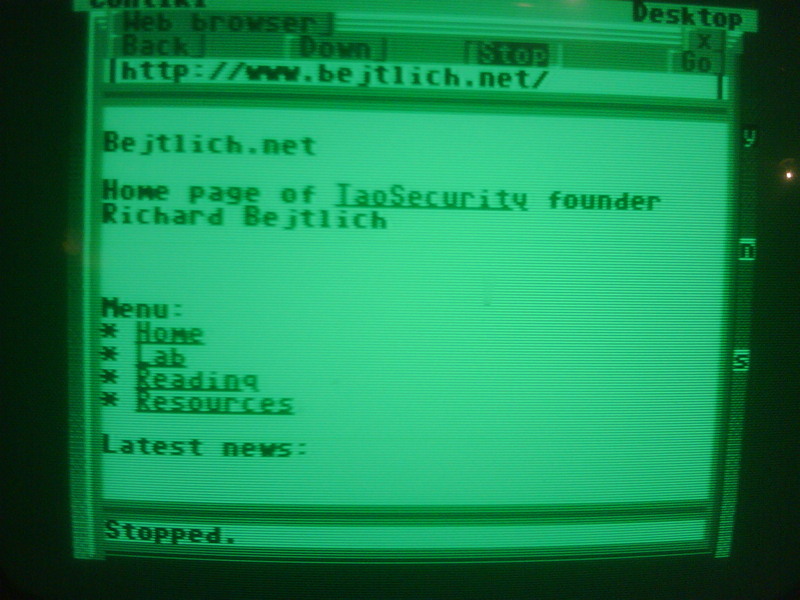 Remember this is a 25 year old computer running a 7 year old Web browser. 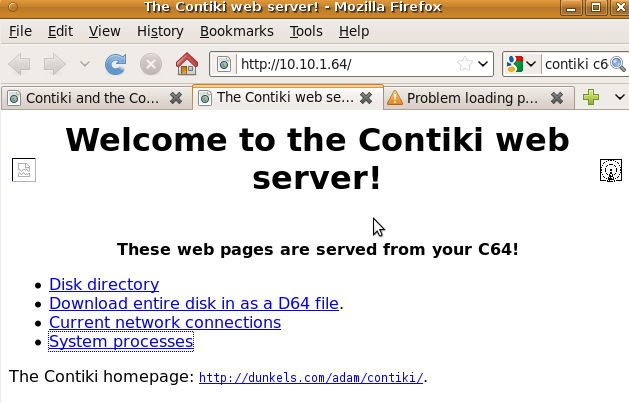 I'd like to try to get a copy of the newest Contiki OS on 5 1/4 floppy to see what improvements have happened in the last 7 years. For example, the Web browser didn't render Google at all. I also couldn't get the Telnet client to run. For all I know that part of the disk could be bad. The Web browser sort of worked, but it was very fragile (unlike the modern Contiki OS version, which is Internet-facing). This was a fun test of this old gear. I've got my original 1200 baud modem (upgrade from a 300 baud) as well, and it still works. I'm not sure it's going to like the Verizon land line in my lab. I also need terminal software for it. That would be another fun trip down memory lane to get the C-64 working with the old modem. At left is a screen shot of the Web server in action, but I think even accessing this page killed it. I consider it ironic that I took these photos with a 2+ year old Blackberry, which has hundreds of times the computing power and capabilities of this setup in probably 1/100th the volume. Can you post about your own lab setup? It would be nice if you put a pictures as well. Thanks. Happy New Year. For fun you can port basic programs over to iPad. Search for Hand Basic on the iTunes app store. All I can say is, "This made me smile!"